Seattle, Washington – the city of the Pacific Northwest, or as some would say, the Pacific Wonderland. Yet, the city of Seattle is entrenched in nature. Seattle is surrounded by water, mountains, and evergreen forests, making for a diverse landscape. This is good news for hiking enthusiasts, as there are tons of hikes – with various sceneries – to choose from. If you live in or visit Seattle, you certainly have options when it comes to embarking on a walk, hike, or backpacking journey. Somme hikes may be mere miles from Seattle’s city center, while others might be an adventure away, just to get there. Despite all the options, you may also choose to go on a road trip to some of these hiking destinations that you should not miss when in the Pacific Northwest. Each national park or forest in the area offers its own experience, such as the Olympic National Park (located on the Olympic Peninsula, to the west of Seattle), and Mount Rainier National Park (located to the south and east of Seattle). 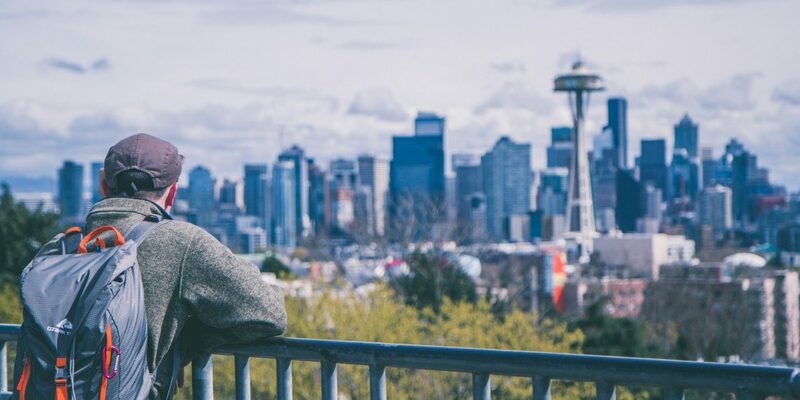 The best part about the city of Seattle is its proximity to some of these expansive areas of public land, including these National Parks – which contain some of the most iconic landscapes in North America and the world. If you are looking for a diverse, yet easily accessible hike, consider the Discovery Park Loop Trail within the Seattle city limits. Located in the Magnolia neighborhood of Seattle, this park – and trail – is easy to access via public transportation. The Loop Trail runs around the perimeter of Discovery Park, which itself has over 11 miles of hiking and walking trail options. The length of the hike (or more of a walk) is also accessible, if you are looking for a brief journey throughout a scenic part of Seattle. The trail is 2.8 miles long, round trip, with only an elevation gain of 140 feet. This hike is perfect for after work conferences or a day of exploring the city of Seattle. The trail passes through a diverse landscape, offering views of the renowned Pacific Northwest trees, ocean vistas, and views of the Olympic Mountains. If you are looking for a more physically challenging hike, consider the Poo Poo Point Trail up Tiger’s Mountain, located in the Issaquah Alps. You will have to ascend over 1,800 feet in elevation, but the views from this hike are worth it. The views from this hike are nothing like the name suggests – this trail offers stunning vistas of Mount Rainer and nearby lakes. Plus, if you go at the right time of year, you will see a rare site in the Evergreen state: the changing colors of the fall foliage. This hike is 7.2 miles roundtrip, and located about 30-40 minutes driving from the Seattle city center. If you have a day off, consider this hike at Tiger Mountain next time you are visiting Seattle. Although the Mount Si trail is a bit further away from the city center, this trail is one of the Seattle classics. Because of its stunning views and the epic road trip it takes to get to North Bend, it is almost certain you will complete this hike at least once during your stay in Seattle. At least 100,000 people annually are not scared away by Mount Si – and we agree. This hike is one of our top choices if you are looking for a day trip from Seattle. If you have a weekend to get away from the busy Seattle city center, consider a retreat to the Olympic peninsula. This scenic part of the state of Washington is home to the Olympic National Park and the Olympic National Forest. Both the Park and the Forest offer many trailheads and hiking options to explore the world-famous Olympic peninsula. Most people leave Seattle to visit the Olympic National Park, and do not bother to visit the similarly named Olympic National Forest. The National Forest offers a variety of discrete, yet well-maintained hiking trails, like the Colonel Bob peak. The Colonel Bob trail, located in the small town of Quinault, Washington, offers everything you could want and more from the Pacific Northwest. Throughout this hike, you will journey 14 miles and nearly 4,300 feet in elevation gain. Couple these distances with the loose rock at the start of the trail, you should be comfortably tackling moderate hikes before you attempt the Colonel Bob trail. This trail offers some technical aspects, and proper gear and attire is required. The Colonel Bob trailhead begins at Lake Quinault. The Pete’s Creek trail, which intersects with the Colonel Bob trailhead, offers a different approach to ascend Colonel Bob’s peak. At only 8.2 miles roundtrip and with only a 3,500 feet elevation gain, the Pete’s Creek trail offers a slightly more moderate route. That being said, both the Colonel Bob and Pete’s Creek trails to the Colonel Bob Peak offer some spectacular views of Mount Olympus, Mount Rainer, and the Pacific Ocean – all part of a 360-degree view from the peak. Did you know that Olympic National Park has nearly 1 million acres of park to explore? It’s no wonder that there are so many options to explore this part of the Pacific Wonderland. Choosing which scenic adventure to embark on only depends on your level of experience and how much time you have to spend away from Seattle. You can choose a hike within the Olympic National Park to fit your level of difficulty and duration, and you cannot go wrong. Easily one of the most popular trails in Olympic National Park, but certainly worth a trip if you are visiting from Seattle. The drive alone has 5-star reviews for its epic scenery, as you journey through the trees. The trip is only 3 miles out and back with just under 1,000 feet in elevation gain, but the views go on for miles. Even on a (typically) cloudy Seattle day, give Hurricane Hill a try – you escape the cloud cover as you ascend on your hike. As you continue, you will become exposed to changing leaves (in the autumn), glacier views, and wildlife spotting. At the peak, you will have 360-views of Olympic National Park, as well as Canada! If you have less time to visit Olympic National Park from Seattle, consider hiking the Skokomish River Staircase Rapids Loop Trail, which is located on the western portion of the Park. The Staircase Rapids Loop Trail is accessible year-round and offers 2 miles of forest along the Skokomish River. The trail does not gain much elevation, and is accessible for all skill levels – making this one of the most popular day trips for visitors from Seattle and beyond. Located in the north of the Olympic National Park, the Klahhane Ridge hiking trail offers a different perspective of the Olympic Peninsula. This hike is especially popular on a sunny day, as visitors from around Seattle come to Sunrise Point to catch a bit of what is coveted in the Pacific Northwest – sunshine. Sunrise Point is known for its relatively consistent sunshine, as the sun peaks through the mountains’ peaks. This 5.6 mile hike does not gain much elevation (only 540 feet), but offers stunning views of the Park, including the Olympic peaks and the North Cascades. When most people think of Seattle, Washington and the Pacific Northwest, they think of the ocean. However, the scenery to the east of Seattle is also magnificent – most of the area east of Seattle is public land, and includes the Okanogan-Wenatchee National Forest. The Okanogan-Wenatchee National Forest is home to Mount Pilchuck, one of the most popular and accessible mountain peak hikes near Seattle. This journey, complete with traveling and hiking, can be completed in a day trip if you are coming from Seattle. The Mount Pilchuck peak trail is located on the Mountain Loop Highway off of Highway 92. The hike to the summit is around 5 ½ miles, but quite the workout due to its steep slope and bit of bouldering near the top. This hike is rated moderate, accessible, and offers stunning views of the Cascades Mountain Range. For this reason, the hike is incredibly popular – and populated. Washington State is known for its iconic Mount Rainier. Mount Rainier is Washington State’s largest volcano, yet it is well-known for its stunning stature as an ice-capped mountain. A trip to Mount Rainier National Park is essential if you are visiting or living in Seattle. The outskirts of the Park are less than 2 hours away from the Seattle city center, and there are tons of options for trails for all skill levels. This 6.3 mile trail is one of the most popular hikes in the Mount Rainier National Park area. The hike ascends 1,000 feet to reach stunning views at nearly 7,900 feet above sea level. The Burroughs Mountain trail neighbors the northeast face of Mount Rainier, and offers a unique perspective of the volcano. There are three legs of this hike; each increase in difficulty as you increase in elevation. All of the “Burroughs” offer stunning views. If you are looking to hike Mount Rainier, rather than simply have views of the volcano, then you should consider the Glacier Basin trail within Mount Rainier National Park. Plus, the trail leads along an old mining road, offering a historic perspective of the area. This 6.5 mile hike makes for a great day trip from Seattle. The trail passes the Emmons Glacier and the Emmons Moraine, which is worth a detour and visit in itself. The Emmons Glacier is well-known amongst ice climbers for its thick ice sheets and stunning views of the colorful glacial lake below. If you are staying in Seattle and want to hike, you are in luck. There are countless options around this Pacific Wonderland city, which is nestled between the Pacific Ocean, Olympic Peninsula, Mount Rainier, and miles of other public land. The hikes mentioned here do not even scratch the surface as to what is available – and there are even more options as you explore offshoots on public land. Next time you are in or visiting Seattle, hike the surrounding areas to experience the archetypal Pacific Northwest.